In this lesson, we will learn how to solve one-step linear inequalities by addition or subtraction. 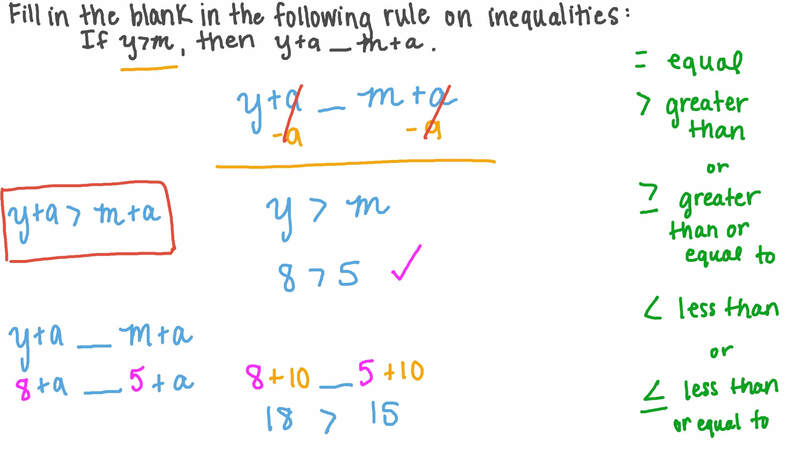 Fill in the blank in the following rule on inequalities: If 𝑦 > 𝑚 , then 𝑦 + 𝑎 𝑚 + 𝑎 . If 𝑎 + 4 6 ≥ 3 9 , then . Fill in the blank: If 𝑏 < 0 then 𝑏 + 1 0 4 1 0 4 . Complete using ≤ , < , > , or ≥ : If 𝑏 ≤ − 5 , then 𝑏 + 1 − 4 . Nada has dollars. 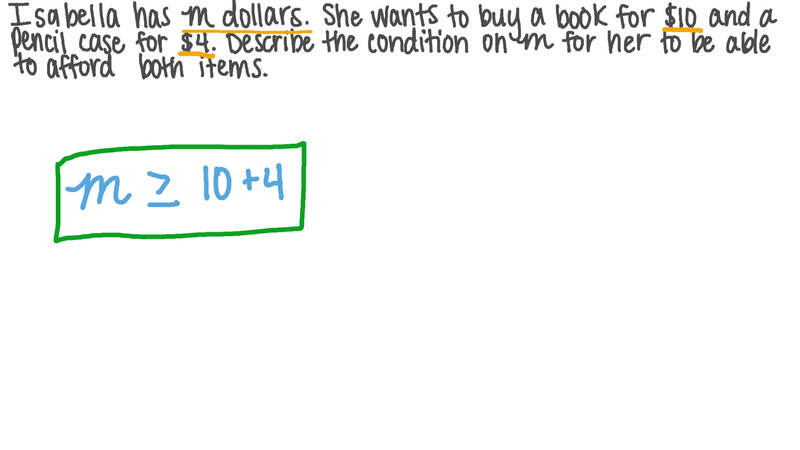 She wants to buy a book for $10 and a pencil case for $4. Which of the following describes the condition on for her to be able to afford both items? An online retailer offers free delivery when your purchase totals $50 or more. Ramy is preparing his order. He has already chosen items which total $42. Which of the following describes the condition on , the cost of the additional items he needs to order for him to benefit from free delivery? Select the option that is equivalent to 𝑎 + 7 < 0 . Given that 𝑥 + 3 4 ≥ 4 6 , what number do you need to add to both sides of the inequality to solve for 𝑥 ? Solve the inequality 5 4 9 > 𝑎 + 9 4 7 in ℚ . Given that 2 1 3 ≥ 𝑥 − 5 1 4 , what number do you need to add to both sides of the inequality to solve for 𝑥 ? 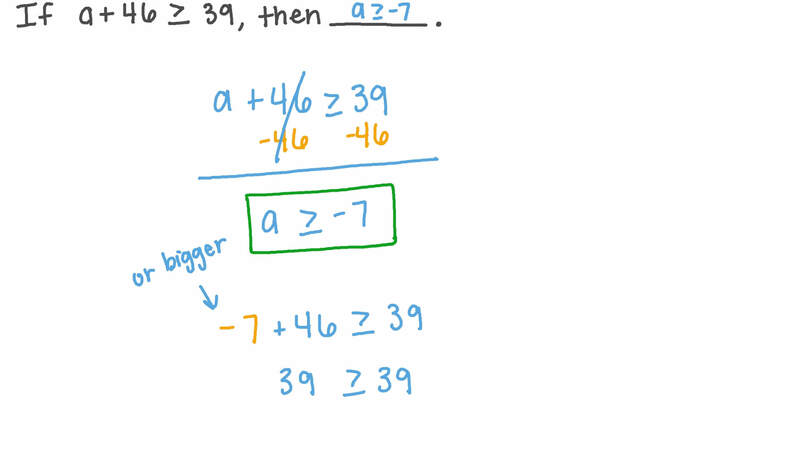 Given that 𝑥 − 2 3 ≥ − 1 2 , what number do you need to add to both sides of the inequality to solve for 𝑥 ? Solve the following inequality: 𝑑 − 1 2 ≤ 1 4 . If 𝑎 + 4 5 ≥ − 3 8 , then .